We would like to share this graph with you. It speaks for itself. For those skeptics wondering about how child poverty is measured in this graph: follow the link we've provided. It's defined in this report as "Share of children 17 years and under living in households with equivalized disposable income less than 50% of median income; Society at a Glance: OECD Social Indicators, 2005, p.57." This is how the United Nations defines poverty. For those doubting the US poverty rate identified in this graph, take a look here. And if you doubt that, follow the links to the source materials. And even if you really want to doubt those (why would you?) - well, the precise definition of poverty that you use doesn't really matter in this graph - for it's the trend: the relationship between the component parts, that is the important (and striking) thing here. It tells a simple story: the lower your taxes as a share of GDP, the more child poverty. See more here. 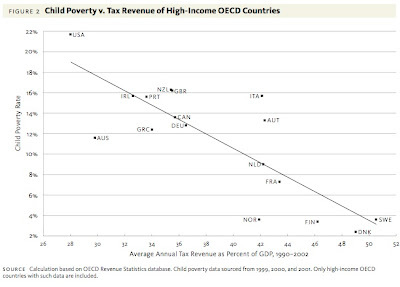 Note that this graph refers to relative poverty within countries (not between them.) Does inequality matter? Yes it does: around the world, it is one of the great political issues of all time. And one last thing: read the full report. It contains much else that might surprise you. Poverty accoriding to this graph is: "Share of children 17 years and under living in households with equivalized disposable income less than 50% of median income; Society at a Glance: OECD Social Indicators, 2005, p.57." Spotted the problem? Median income is far higher in the US and Switzerland than e.g. Scandinavia (PPP adjusted), which in turn has far higher median income than Portugal. Rendering the graph DEEPLY misleading. It proves not that the is more poverty (by any reasonable definition) in the US, but that there is more inequality WITHIN the US compared to inequality within say Norway. What it doesn't tell you is which country has more people worse off in absolute (i.e. what they can actually obtain) terms. Which is what matters. This is crucial. It means that it could be the case that unequal societies with lesser tax burdens could in fact be better for the worst off, in a sort of 'rising tide lifts all boats' argument. Anathema to you of course, but this graph isn't the smoking gun you seem to think against that view.